Opiate addiction is a dangerous condition that can be both frustrating and scary for the addict and for those around them. Much of the frustration associated with opiate addiction lies in the inability to control a compulsive desire to continue using opiates despite known physical and psychological consequences associated with using the drugs. Fortunately, there are many types of treatment for opiate addiction that can assist patients in overcoming both the physical and psychological dependence on this dangerous drug and regaining control of their lives. Opiate detox is the very first step of any opiate addiction treatment process. Opiate detox is not a comprehensive opiate treatment program and should not be considered the only form of treatment necessary in order to help a patient successfully rid themselves of a dangerous opiate addiction. Various types of opiate detox exist including rapid detox which involves placing the patient into a medically induced coma while the opiates are medically removed from the body eliminating physical dependence in a matter of hours rather than days or weeks. Other forms of opiate detox include medication based detox, natural detox and holistic detox methods. Regardless of which type of opiate detox you choose, it’s important to remember that opiate detox is just the first step of any opiate addiction treatment program. Residential opiate addiction treatment takes place in an inpatient facility where medical monitoring and support are provided around-the-clock. Opiate addiction treatment in a residential treatment center includes counseling, therapy, meals, housing and various other services that assist the patient in overcoming physical and psychological dependence on opiates. For most patients, residential opiate addiction treatment provides the best possible chance for a full and successful recovery from addiction to opiates. 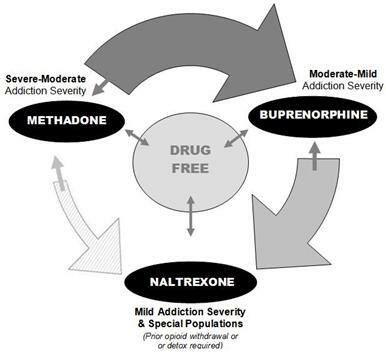 Medications such as methadone or suboxone have been proven to assist in the recovery from opiate addiction when used properly. Unfortunately, some medications that are commonly used as a part of addiction treatment are addictive which means there is the inherent risk that by taking such medications the patient may become addicted to another drug. It’s important to talk with a doctor or treatment specialist prior to entering into an type of medication based opiate addiction treatment program to ensure that it’s the right choice for your individual situation. During outpatient opiate addiction treatment the patient will make several trips to an outpatient facility where counseling and therapy are provided in addition to various other services such as drug abuse monitoring, medical monitoring and support. Outpatient opiate addiction treatment is ideal for those who have already attended an inpatient treatment program or for those who have a very significant support system at home. Because less monitoring is provided during outpatient opiate addiction treatment, this type of treatment is not recommended for those who have been using opiates for a prolonged period of time or who have already tried to quit using opiates and have failed.